Rocket Car Racing is a new adventure emerging from within suburban streets across the globe. 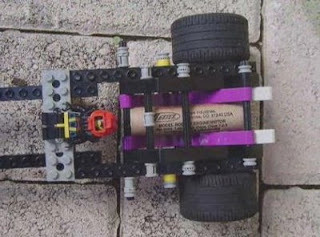 Builders construct their rocket cars with existing toys, DIY and or hobby components like Lego bricks which have been fitted out with rockets scaled-to-size. First up is the Lego Rocket cars by Claudio Di Leo and Alois Di Leo, which has an interesting soundbed of world music tracks. Next is the Rocket Powered Matchbox Cars explained video. Finally there is a well organised group in Sydney: RocketCarDay meeting of DIY nerds. Watch their mpg video here. Among the rules for participation are: Two race categories, one for tested cars and one for first run cars. While you can make any kind of car, sticking wheels onto a rocket will incur some sort of shame demerit. Similarly, sticking a rocket onto a car is equally subject to frowning. Remote Control is not allowed Whereas Gyroscopic control is. Also, there are the; Materials allowed, Weight specifications, Types of motor, Body shapes and Wheels. Go here too unpack the finer detail of the rules. Perhaps it all began here, or perhaps its merely another offshoot of this.